modification, containing a lot of instruments, adding some cool stuff, and having some fans. This is the first instrument added to this mod: Small Piano. It’s key scale is pretty small because of the piano’s size, and it doesnt contain pedal. After placing, simply right click the piano. The GUI opens and you are able to play with your mouse. If you want, you can toggle keyboard on and play just like you were in the front of real piano! A bigger piano. Its 2 blocks wide and 2 blocks high. Has bigger key scale than small piano, but still smaller than the grand piano. It contains pedal, which can be used to make sound longer. The piano works just like small piano does. The only differences are that it has larger scale of keys, and it contains pedal. To use pedal, hold left shift while playing. The pedal makes the sound longer. This is last type of piano. Its 2x2x2 (8 blocks), has the biggest key scale, and also contains pedal. Grand piano works like big piano and small piano, but it has the largest scale, and contains pedal. Drum kits contain 4 cymbals (Crash, HiHat[opened/closed], Ride, and Splash), and 5 drums (snare drum, 3 toms, and kick). There are in 5 colors (Black, Blue, Green, Red, and Yellow), you can choose the one you like the most. To use a drum kit you have to have drum sticks. 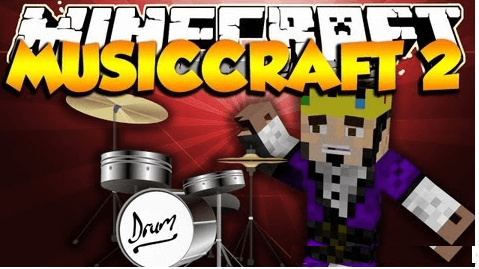 After placing drum kit, craft yourself some drum sticks (recipe in crafting recipes tab, scroll up this page and click an arrow to the left). Then, while holding it in your hand, right click the drum kit. You can now play with keyboard or mouse. The amplifier itself doesnt do a lot ? after placing, it can be only turned on/off ? just right click it. If the yellow light in front of it is highlighted, then its turned on. When you turn on an amplifier, hold a guitar, and are maximum 4 blocks away of it, then the guitar’s sound is distorted (that metal/rock sound). When you turn it off, it does nothing. Organ is special, key instrument with church-like sound. All you have to do is right click it. Then GUI appears and works like in pianos. Keyboard is an electric instrument added in MusicCraft 2.5. It’s special function is sound changing ? it contains 4 different sets of sounds. You can change them while playing! Right click to open the GUI. Then, you can play. You can use space (if keyboard is ON), or Effect button to change sound (there are 4 sets). Cello is a big, stringed instrument. Its 2 blocks high. You cant pick it up, if you right click it you will open the GUI. To play cello right click it. The GUI appears and works like in other stringed instruments ? basses, guitars, violins etc. Xylophone is another idiophone. Its made of cast iron, gold ingot and some wooden bars. Its sound is short and high, you can play very funny songs on it! To play the xylophone, you have to make xylophone sticks (check about crafting tab above to find out how to make these). Then, hold them in your hand and right click instrument. Play! To open guitar GUI, press G while holding a guitar. To get distortion, simply place near you (4 blocks range) an amplifier, and turn it on by right clicking! Guitars are little bit confusing. If you know how does real guitar work (for example if you play a guitar) it will be easier for you to understand how to use it in game, but even if you havent ever touched a real guitar i will try to explain you how it works. If you toggle keyboard on, you will get keys along the fretboard, and numpad keys on the right (orange text) showing you which key is which string. It means, if you just press Numpad 7, you will get sound of the highest string, numpad 4 for lower, then numpad 1 and 0 for the lowest one. If you hold for example ?R? on your keyboard, and then press numpad 4 ? you will get sound of second string increased, because you are holding fret 3(W is fret one, E is two, etc). So if you want to press seventh fret on the highest string, you have to hold ?8?, and then press numpad 7. I hope you understand now. Try it yourself and you should get how it works. Another important thing is that real guitar has (usually) 6 strings. Because on the keyboard theres not enough space to make that, i made a toggle-strings button. The real guitar strings are ordered E, B, G, D, A, E. So at start you have got strings E, B, G, D (where E is numpad 7, B is numpad 4, G is numpad 1 and D is numpad 0), but if you click on toggle strings button, or press numpad 2(it has the same function), you will get strings G, D, A, E (G-num7, D-4,A-1,E-0). Understand now? So, lets play the guitar now! *Note: Its funny, but i noticed that the most comfortable combination is to hold the keyboard upside down just like a real guitar! To open bass GUI, press B while holding a bass. The GUI works just like the guitar one, so read it’s instruction to find out more about usage. Violin is another stringed instrument. To use it, you need a violin bow. Just right click with the violin bow while holding a violin. The GUI pops up and works just like the guitar one. Trumpet is first brass instrument. Its pretty loud. To open trumpet GUI press N while holding a trumpet. The GUI works like the piano’s one, its very simple to use. To open GUI press H while holding a saxophone. GUI of it works just like the piano’s GUI, pretty easy but cool.